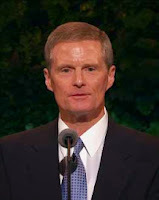 "Thus, the Savior has suffered not just for our sins and iniquities—but also for our physical pains and anguish, our weaknesses and shortcomings, our fears and frustrations, our disappointments and discouragement, our regrets and remorse, our despair and desperation, the injustices and inequities we experience, and the emotional distresses that beset us. "There is no physical pain, no spiritual wound, no anguish of soul or heartache, no infirmity or weakness you or I ever confront in mortality that the Savior did not experience first. In a moment of weakness we may cry out, 'No one knows what it is like. No one understands.' But the Son of God perfectly knows and understands, for He has felt and borne our individual burdens. And because of His infinite and eternal sacrifice (see Alma 34:14), He has perfect empathy and can extend to us His arm of mercy. He can reach out, touch, succor, heal, and strengthen us to be more than we could ever be and help us to do that which we could never do relying only upon our own power. Indeed, His yoke is easy and His burden is light. 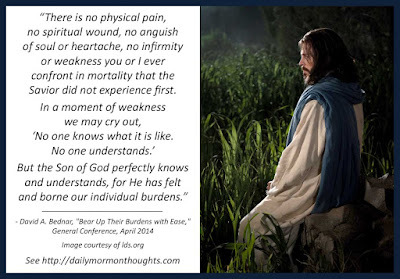 "The unique burdens in each of our lives help us to rely upon the merits, mercy, and grace of the Holy Messiah (see 2 Nephi 2:8). I testify and promise the Savior will help us to bear up our burdens with ease (see Mosiah 24:15). As we are yoked with Him through sacred covenants and receive the enabling power of His Atonement in our lives, we increasingly will seek to understand and live according to His will. We also will pray for the strength to learn from, change, or accept our circumstances rather than praying relentlessly for God to change our circumstances according to our will. We will become agents who act rather than objects that are acted upon (see 2 Nephi 2:14)." What took place in the Garden of Gethsemane? The Savior suffered for our "sins and iniquities," but that was just the start. Elder Bednar reminds us that the His Atonement also includes help and relief for so many of the temporal—physical and emotional—struggles and challenges we encounter in mortality. Because of Him, we have a source of understanding and support that will bless us in every way that we allow it to! Because of what the Savior experienced, we believe "He has perfect empathy" that enables Him not only to understand but then to help: to "reach out, touch, succor, heal, and strengthen us" in all of our needs. What a profound and eternal gift! In order to receive those blessings, we "take His yoke upon us" by linking ourselves to Him through sacred ordinances and covenants, and learning to "live according to His will." Then we can begin to receive strength and power from Him through our prayers, not to change the circumstances of life, but to be blessed to endure them well. That's a profound and critical difference. How grateful we should be for all that He offers to us!